The first time I ever recall using a MoonBoard was in Cape Town, South Africa. 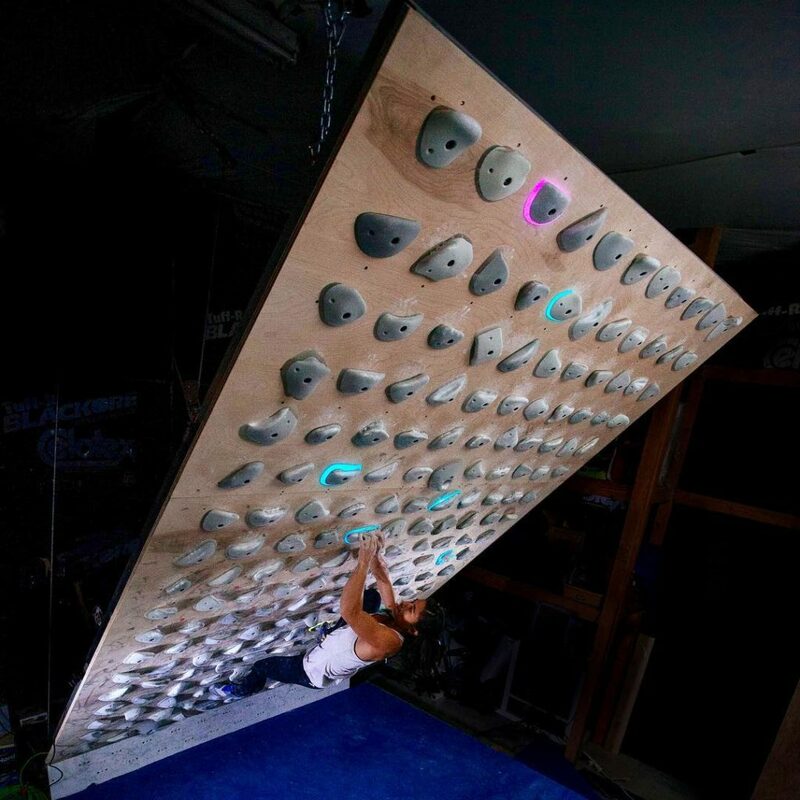 With small square footage and predominately vertical terrain, the gym had purchased the MoonBoard as a way to have a plethora of climbs that were different, steep and could appeal to the stronger climbers. A binder of print-outs indicated the available climbs, each organized by grade. Climbers had to study the lines, locate the holds at the intersection of the letters and numbers, and remember the holds as they attempted the climb. The grades were all incredibly stiff, and there were no “warm-ups.” I remember not being able to complete a single climb, feeling that the moves were too far and the holds were too small. I wondered if the wall was intended only for elite climbers, and in a way, it is. 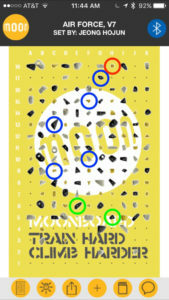 I had difficulty remembering the holds when many of them were similar in shape, and all were black, white or yellow. I didn’t see another MoonBoard for years and nearly forgot about them until they started to pop up in gyms in the states. Slowly at first, but then it seemed as if every new gym built had a MoonBoard and older gyms were installing them as fast as they could. This burst of Moon excitement came about as the app was launched, as well as the addition of the LED lighting. 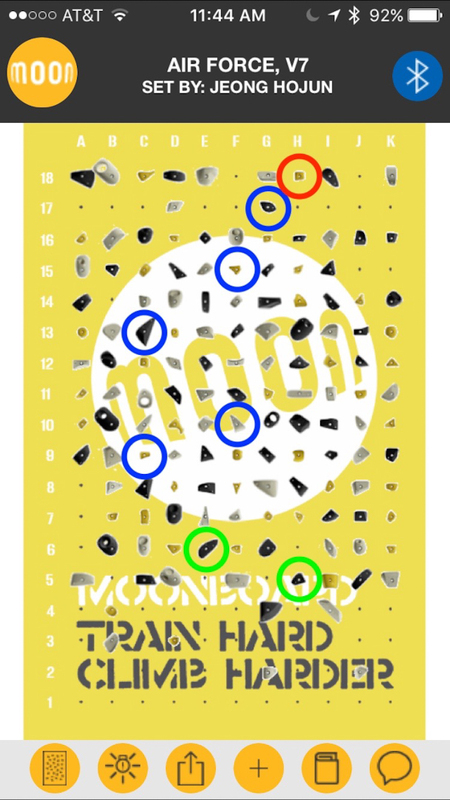 Now, not only were there the original climbs created by Ben Moon himself, but anyone could now create and grade climbs. Others could rate and comment on grades as well as maintain a scorecard under their accounts. Gyms which had been declining in check in’s were seeing surges in members just from their addition of the MoonBoard; Instagram stories were full of training videos and all of a sudden, anyone who had enough space for a MoonBoard essentially had a vital tool for training and improvement. 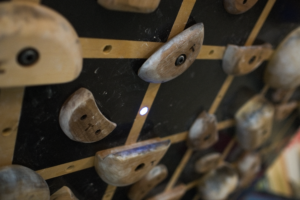 Still, the board was for more elite climbers, but with the addition of the app, the grades became a little more diverse and allowed climbers to set for themselves, making climbs more varied and less height dependent. It became a way to test oneself against others across the world. It became a public scorecard, a public challenge, and the closest thing to an 8a.nu logbook as indoor climbing can get. While this surge occurred, two growing climbing hold companies in Colorado took notice and formulated plots of their own. They observed the downfalls of the lighting mechanism, the app, and the overall style of the wall. 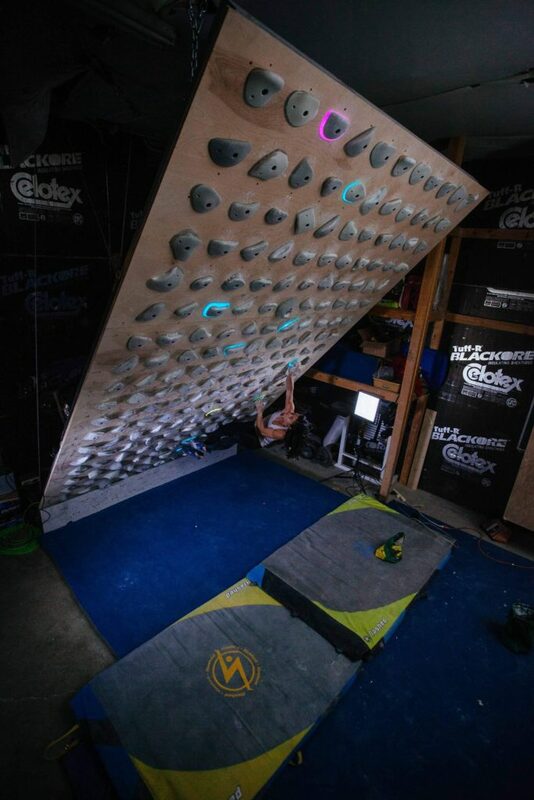 Tension, a Denver-based wood holds company, and Kilter Grips, a Boulder-based polyurethane hold company, quietly worked behind the scenes to create their unique versions of the MoonBoard while watching the demand for this style of training wall continue to grow. First to launch was Tension. Already known for their wooden hangboards, portable hangboards, holds and campus rungs, their training wall is also wood based. The wood is slicker than the MoonBoard holds, but provides salvation for your skin, in comparison to the highly textured competition. The Tension board app also allows for “foot only” holds at any point during the climb, giving more control to the routesetter to force specific movements. Additionally, there are more large, sloping holds, as well as the small crimps and pinches like the Moon Board, making more styles of climbing possible. It didn’t take long until Tension Boards started popping up around the Colorado climbing gyms. Last to arrive at the training wall game is Kilter. While the MoonBoard and the Tension Board rely on small colored LED bulbs under each hold, Kilter chose to add a lit border around each hold, making it much easier to see each hold as you climb. Ben Spannuth, and Gabe Adams. The original concept came from Will and Ben who began with campus rungs to minimize initial investment. The plan was always to develop the Tension Board, but they needed to build clout within the industry. Next, they launched the hangboards and climbing holds. These wooden climbing holds later became the same holds seen on the Tension Board today. 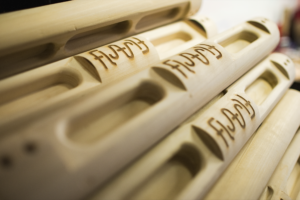 Through trial and error, they learned that poplar is the best wood to use for large holds, while cherry wood is better for small holds. It took roughly a year and a half of tinkering and marketing before they released the board, and so far the hype around the beautiful wooden board is vast- recently even German phenom Alex Megos visited the Tension Warehouse to try his hand at the training wall. The idea behind the Tension Board was to create something with training in mind. Will, who had been a coach and trainer for years, used his cumulative knowledge and applied it to the design and construction of the wall. 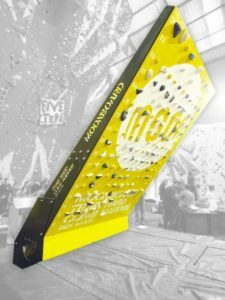 He wanted to create a dedicated training tool for climbers, which is further achievable through its set up as a symmetrical wall. Through the use of symmetry, climbers can train the muscles and tendons equally, see where weaknesses lie, and train repetitions for endurance. With research and experience, Will and his team created a product that needed no change from the original concept. The primary customer feedback Tension has received is in regards to the app. Fortunately for the guys, all the feedback had already been on the list of things to add or change, once again validating their knowledge of the market and their customers. To make the phone app even more user-friendly, climbers can create a boulder problem and then click the “mirror” button to illuminate a replica for the other side of the body. With such a small company, technological changes are slow due to all the other responsibilities each team member has within the company. Will says, “The board as it is now is just the beginning. We have a lot of plans…” so we are excited to see what is next. a home wall and certainly within reason for any gym. With the optional kickboard and the ability to install the board at many different angles, the board can fit in rooms with ceilings as low as 8-feet. The cost includes all 303 holds and the LED kit, and if the wall is prepped for installation, it will take two first-time users roughly 4-6 hours to install all the holds and lights. 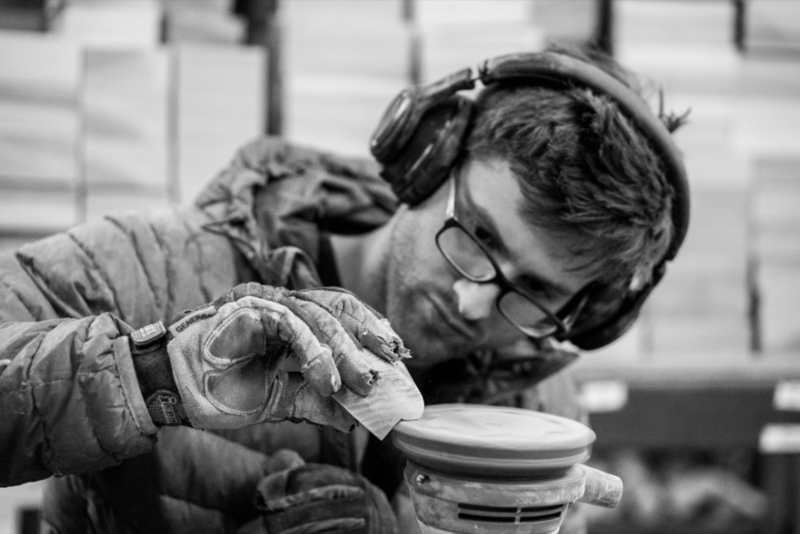 Ian Powell, founder of e_Grips climbing holds, founded Kilter Grips in 2013. 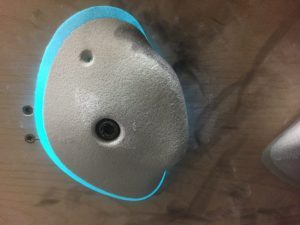 What began as a small hold shaping company behind the walls of The Spot Climbing Gym in Boulder, Colorado turned into the company it currently is- producing over 2000 different holds in 2018. 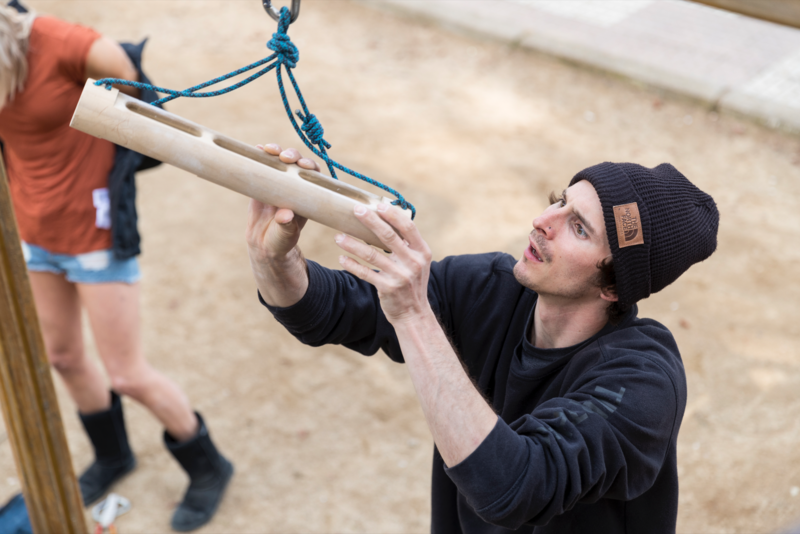 While Ian still shapes most holds, Kilter works with different pro-setters and pro climbers as well, including, Keith Dickey, Will Anglin, Alex Puccio, Jimmy Webb and more. Three other people comprise the team behind Kilter, including head setter of The Spot, Jackie Hueftle. Unlike Tension, Kilter primarily is a climbing hold company, and the Kilter Board was not on the original itinerary. 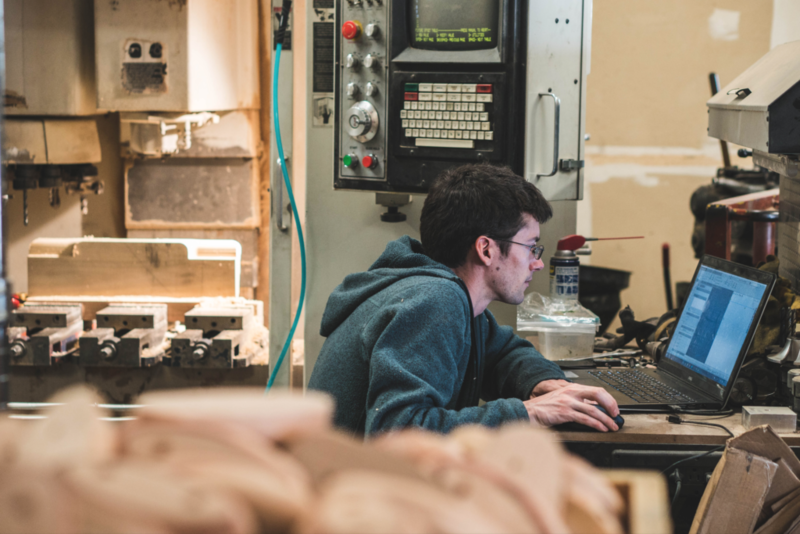 Kilter’s first idea was to work with Ben Moon himself on his MoonBoard, but after meeting with him in person, it didn’t seem like there was a logical way for the two companies to work together. A longtime friend of Hueftle’s, Peter Michaux of Aurora Climbing in Canada, was an integral part of the inception and growth behind the Kilter Board. Michaux is responsible for creating the app and lights for Kilter and initially approached Kilter with the desire to create a new board and app with different capabilities and a more diverse target audience than the MoonBoard. Coincidentally, when Kilter was not quite ready to move forward with board design, Hueftle linked Michaux with Tension to help them as well. finally had the time to allocate to the development of the board, Ian decided to make all new holds for the board to work with the lighting system they envisioned. This process, in turn, took much longer than anticipated, further pushing back their timeline, but the result is precisely what they wanted. Kilter is currently still in the pre-release phase with the board and has been testing holds and layout schemes since fall of 2017. 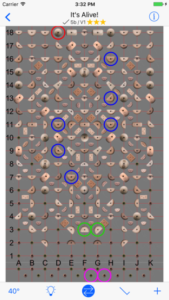 Kilter has a friendly approach to the market, urging gyms to acquire all three types of boards for their unique capabilities and differences. Kilter makes several different boards: Home (8’ wide by 12’ tall), Wide Home (12’ wide by 12’ tall) and Commercial (12’ wide by 14’ tall). All walls can be adjusted angles or fixed at any 5-degree angle (30, 35, 40, 45, 50, 55, 60, 65, 70 will be most common). As the wall is not currently available for at-home purchase, the retail price has yet to be determined. However, the new bouldering gym, The Longmont Climbing Collective, and Monkeyhouse in Carbondale, Colorado are both currently getting boards installed. One essential observation I have made between the three boards is that the MoonBoard has no “easy holds” and is not intended for climbers that perform below the V4 level. The Tension Board and Kilter Board both offer more of a variety of holds to create more accessible combinations. With the adjustability factor of these walls, the climbs can also become less severe. The goal with both of the newer boards was to give more levels of climbers a better way to train and only time will tell what the gyms and customers think. 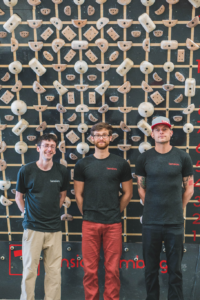 Kilter and Tension, while technically competitors, are two groups of climbing enthusiasts and friends; they work together, and share the same app developer- proving how much the climbing community really is a family. 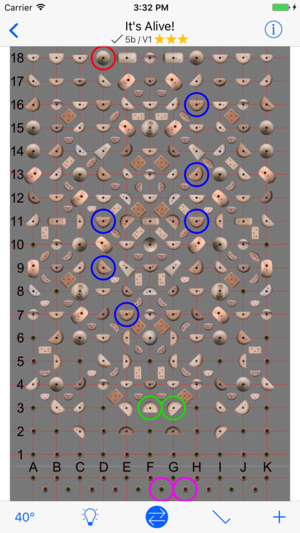 While each board has its own app and might appear similar in concept, considering them to all be the same is equivalent to viewing all hangboards to be the same. 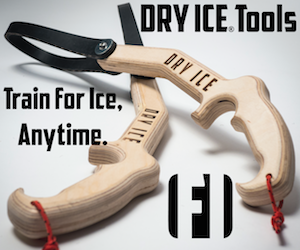 These might cost a heck of a lot more than a hang board and require a lot more space, but they can act as an at-home climbing gym for anyone who wants some extra training, anyone who doesn’t want to join a climbing gym, and anyone who might not have access to a quality climbing facility. If forced to choose just one board, it comes down to personal preference, but if you are fortunate enough to one day have a gym that features all three boards, you will be a better climber for it!